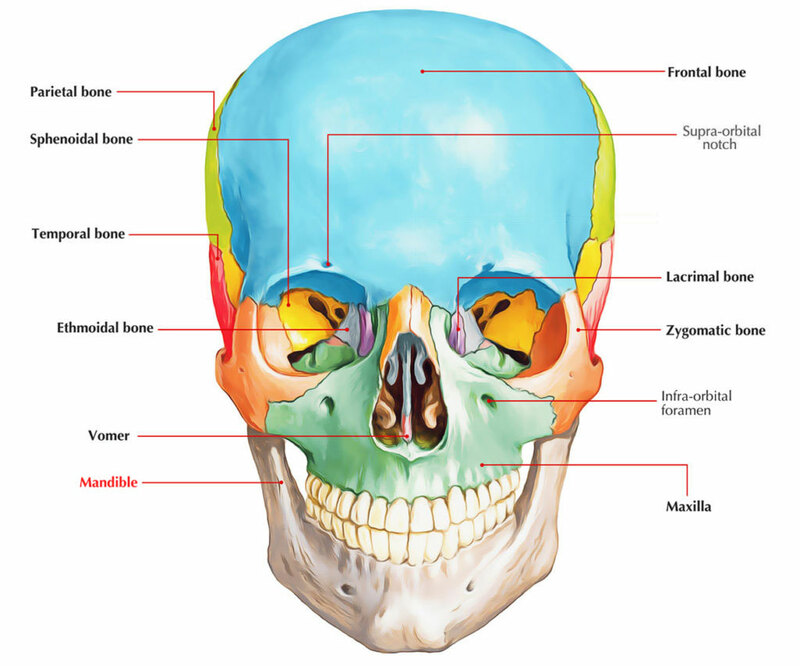 The body of the mandible is curved to a certain degree like a horseshoe, structurally. It comprises of two surfaces and two borders. 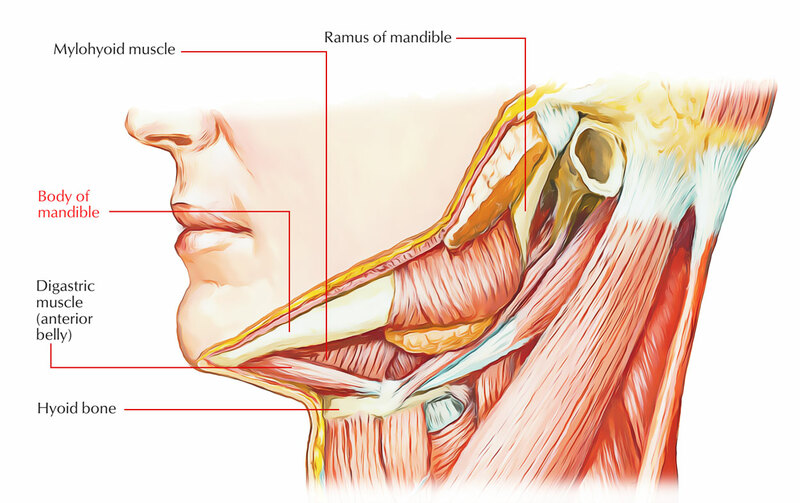 A slight ridge externally marks the mandible in the midline, denoting the symphysis or line of junction of the two pieces from which the bone is made up of at an early phase of life. This ridge splits inferiorly and encompasses the mental protuberance which is a triangular eminence. The base of mental protuberance is elevated on both sides in order to create the mental tubercle but has a recession centrally. Superior margin of the body is known as alveolar process. It possesses openings of lower 16 teeth. A small recession called digastric fossa is present on either side near the median plane on the inferior margin or base of the mandible. It provides connection to the anterior belly of the digastric. Symphysis menti is a faint median rim on the external surface of the body. It marks the line of fusion of the two halves of the mandible at the age of 2 years. The symphysis menti expands below into a triangular elevation termed mental protuberance. Mental foramen is located under the interval in the middle of the premolar teeth and gives route for mental nerve and vessels. Oblique line is the extension of the anterior margin of the ramus and travels downwards and forwards towards the mental tubercle. Incisive fossa is a shallow recession just inferior towards the incisor teeth. Mylohyoid line is a protuberant oblique rim that travels obliquely downwards as well as forwards from the back of the 3rd molar tooth approximately 1 cm inferior to the alveolar margin towards the symphysis menti under the genial tubercles. Mylohyoid groove is located below the posterior end of the mylohyoid line. Mylohyoid nerve along with vessels travel in this groove. Sublingual fossa is a shallow zone over the anterior portion of the mylohyoid line and contains sublingual gland. Submandibular fossa is a slightly scooped out part under the posterior portion of the mylohyoid line and contains submandibular gland. Buccinator emerges from oblique line below the three molar teeth. Mylohyoid emerges via mylohyoid line. Genioglossus emerges via superior genital tubercle. Geniohyoid emerges via inferior genital tubercle. Anterior belly of digastrics emerges from digastric fossa on the base of mandible near symphysis menti. Platysma is implanted within the base. Superior constrictor emerges from the region over the posterior end of the mylohyoid line.